This time of the year it’s always good to start talking about price computing scales. If you currently own a set of scales, then you need to get them out and make sure they are weighing correctly and displaying correctly on both sides. You also need to make sure the battery is working if you have a built in rechargeable battery. The CAS S2000 Junior retail price computing scale is popular with customers who want a reliable scale that they can use at the market when selling their fruits, vegetables, candy and more. Sure there are less expensive scales out there, but often those scales are constantly needing parts while the s2000 jr keeps on working. It’s hard to believe, but we’ve been offering this scale to our customers since 2006! In that time, we’ve accumulated more than a few questions from our customers, either before the sale or after the sale. So, below are the top frequently asked questions about the CAS S2000 Jr scale. Hopefully, if you’re in the market for this scale, your question will get answered below. If you still have questions be sure to contact our sales department. Q: CAS S2000 Junior operation instructions? A: Basically, the way the scale works is as follows. Place your items on the scale. Items could be strawberries, bananas, pumpkins, fudge, frozen yogurt, nails, screws, bolts etc… whatever you need to charge the customer by the pound, kilogram or ounce. Then enter your price per pound that you want to charge the customer. Once you do that, the scale will display the total charge on both the front side (operator view) and back side of the scale (customer view). Q: Does the S2K JR scale have a change calculating function? A: No, it does not. You might want to see the Rice Lake RS-130. Q: If the scale includes a certificate of conformance number (CoC#) do I still have to get these scales tested and calibrated for commercial use by the state? A: Best answer is, contact your individual state weights and measures department. Each state has their own rules regarding certified scales. Generally, you will want to purchase a NTEP approved scale with a CoC# (which the S2000 Jr has). Q: Can you tell me if the increments are by 0.01 or 0.02 or something else? A: The s2000 jr is available from Central Carolina Scale in three different capacities. 15 lb, 30 lb and 60 lb. Each of those is what we call “dual range”. Dual range means that the scales display a certain increment until they reach half capacity, then they display a different increment from half way to full capacity. For example, on the 60 lb capacity model… the scale will display increments of 0.01 pound on weights that range from 0 to 30 pounds. Then from 30.02 up to 60 pounds, the scale will display in increments of 0.02 lb. Q: Does this scale weigh in Ounces? A: Yes it does. Great for frozen yogurt shoppes. Q: How long can the unit operate on a single charge of the battery? A: Manufacturer says around 200 hours with no backlight and auto off functionality. Q: What capacities are available and which should I choose? A: 15, 30 or 60 pounds are the capacity choices. With the dual range capability, this scale is kind of like having two scales for the price of one. Most customers selling berries or smaller fruits and vegetables would choose a 30 lb or 60 lb capacity. Candy or yogurt stores might choose the 15 lb capacity. Q: What is the battery life between charges? A: According to CAS, Approx. 200 Hours LCD (no backlight) with a 12 hour charging time. Q: I have your quote for the CAS s2000 JR. It costs more than the ____, why should I buy the S2000 Jr instead of the cheaper scale? A: The s2000 JR is a reliable scale that is popular with customers. We have sold just about every retail scale out there and the s2000 jr is, in our opinion, the best overall value in price computing scales that we currently offer. Who knows, that might change sometime down the road, but as of now, this is the best scale for this type of application. The cheaper scales, in our experience, tend to have components that fail more often. So with those scales, you tend to be replacing AC adapters and keypads more frequently. Q: Hi, I own a frozen yogurt shop. Will this scale read in 0.1 ounce? A: Yes, the 15 lb capacity scale and the 30 lb capacity scale would be the best choices for you to consider. Q: If I was interested in adding a label printer, would this scale allow me to put a custom logo or company name on the label? A: Sorry, but the CAS S2000 JR has limited capability in this area. Logos and customization would be something you might see with CAS advanced label printing scales like the LP1000 and CL5000. Q: Do you offer a replacement battery for the CAS S2000 JR scale? A: Yes please call our sales department. Q: Is this NSF certified in the US for deli usage? A: No, this is not NSF certified. However, the scale is NTEP legal for trade. Q: Does this scale have a rear display for the customer to see? A: Yes this scale has rear display for weight and price info. Q: What type of battery does the s2000 JR take? What is the replacement cost for the battery? A: Takes a Rechargeable Battery, normally in stock. Call our sales department for price and availability. Q: What is the platter size? A: 12 (W) x 8.75 (D) inches. Q: Where is the CAS S-2000 Junior scale made? A: To the best of our knowledge, this scale is made in either China or South Korea. Q: Do you have a better Owners Manual / User Guide? A: Unfortunately, no. Several customers have complained over the years about the manual. Q: How many Price look ups does the scale have? Q: Does the S2000 JR scale arrive calibrated? A: The scales are calibrated at the factory or by us before you receive yours. So in most instances the scale should be accurate when you receive it. Note, every now and then, a delivery company will decide to treat the box like a football and that could lead to the scale being out of tolerance when you receive it. Q: Is this scale legal for trade? Q: Why should I buy this scale from you when I can get it from other websites online? A: We are an authorized CAS dealer and have a direct relationship with them in New Jersey. We also typically stock the scale. 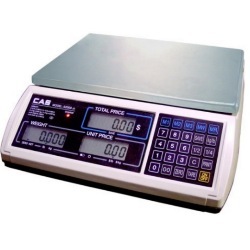 That means fast delivery and accurate calibration, so when you order your scale from Central Carolina Scale, you know that you will receive it quickly and it will be accurate. Q: What are dimensions of the scale? Q: Does the scale have dual display? A: Yes, it has displays on the front and back showing the weight, price and total cost. Q: Does the S2000 Junior have a battery included? Q: Can this scale add up multiple transactions for a total for the customer? A: For that, you might want to take a look at the Ohaus Aviator 7000, or many customers just have a calculator beside the scale. Q: Can I attach a pole display to the CAS s2kjr model? A: No, in order to have a pole display, you would need to order the pole display version of the scale. We hope that this page has helped you out regarding the CAS S 2000 Junior retail scale. If you’re looking for a reliable price computing scale, this would be a great choice. The fact that the scale has three different capacity choices, each with “dual range” capability, make this a great choice that is both versatile and accurate. If you have questions or would like to place an order, call us (919) 776-7737. Impacts That Factor in the Price of a Truck Scale? A couple of years ago we discussed the ever popular how much does a truck scale cost? Today, we answer a similar question. What factors impact the price of a truck scale? When purchasing a large piece of equipment, such as a truck scale, it can be hard to look past the price tag. However, to ensure you are investing in quality equipment that will last your business a generation or more, it is important to understand the factors impacting total purchase price. Elements such as design, craftsmanship, components and foundation of a truck scale all impact the final purchase price. Although the weighbridge (the structural body of a truck scale) can have varying designs depending on the manufacturer, it performs the same basic function across all brands and models: weighing trucks. Manufacturers who use a wide flange I-beam weighbridge design often have a higher steel content in their truck scales than manufacturers who utilize bent plate or steel tubing designs. The number and size of beams in a weighbridge can also impact steel content. Designs that place larger beams closer together offer more support for vehicles than designs with smaller beams placed further apart. The support from larger beams means the deck won’t bend as easily, so the truck scale will provide accurate weighments for a longer time. To better understand the cost of the truck scale steel content, divide the cost of the scale by its shipping weight to get the price per pound of the scale. This can be used to compare the price per pound of similar scales from different manufacturers. You may find the scale with higher steel content actually costs less on a price-per-pound basis. Quality craftsmanship also contributes to a truck scale’s integrity. Purchasing from a company that invests in engineering and manufacturing ensures that there is a highly skilled team behind each and every truck scale. The components that make up a truck scale are just as important as the team behind it. Companies who take the time to source high-quality load cells, steel, cables and other components often have a higher quality product. The installation of the truck scale will also impact the final price. 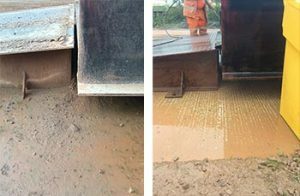 Installation includes excavation, the cost to pour the concrete foundation, off-loading and positioning the scale, installing electronic components and performing the initial calibration of the scale. The truck scale installation should be performed by professional scale technicians who have experience working with scales from the manufacturer you chose. This expert installation will ensure proper scale operation and reliable weighments over the life of the scale. 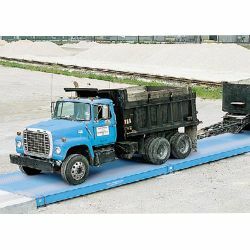 A truck scale is a significant investment, and design, quality and installation all impact the final price of a truck scale. Choosing a truck scale with a heavy-duty design, superior engineering and components backed by industry experts gives you a scale that will last for a generation or more. For more information on purchasing a truck scale, please contact the Central Carolina Scale heavy capacity sales department by calling (919) 776-7737. This entry has a single focus. What is the best animal scale for your veterinary hospital? For us, the answer is pretty simple. It’s the WeighSouth VS-2501 Vet Scale. This stylish animal scale features a heavy duty design and is popular with customers. The VS-2501 features a large easy to clean 43″ x 20″ stainless steel platform with four load cells underneath. The scale platform is factory calibrated to the digital weight indicator for immediate use once the scale is received. The indicator features a heavy duty metal enclosure with large LED digits making it very easy to read. Place the indicator on a desk top or mounted on a wall with the included hardware. Why settle for some “no name” vet scale when you can have this VS-2501 industrial strength veterinary office digital scale! Your scale can say a lot about the quality and image of your animal hospital. If your’re a veterinarian or perhaps you work at an animal hospital. You know that customers take note of what equipment you are using. That’s why it’s important to utilize what we consider, the best animal scale for your veterinary hospital, the VS-2501. You need to show your customers that your passion for animals requires nothing less than the best and with the VS-2501 vet scale you make it very clear that your passion for great quality and outstanding care is important to your business. Weighing small to large animals, it’s hard to beat the quality and construction of the WeighSouth VS2501 Veterinary Scale. While these types of products are often thought of as floor scales for dogs, the large 43” x 20” stainless, Weighsouth VS-2501 vet scale steel platform is large enough for Lamas and Alpacas, yet small and accurate enough for the smallest breeds of dogs, sheep, goats, hogs, nursery pigs, and many more varieties of livestock. The scale operates on either AC Adapter or internal rechargeable battery. The scale includes a removable non-skid rubber mat to ensure extra grip for animals to keep them from slipping when stepping on or standing on the scale. Hopefully, after reading this, you’ll appreciate why when folks ask us, what’s the best animal scale for your veterinary hospital, you see why we choose the VS 2501. Contact our sales team today at (919) 776-7737 or complete our Request a Quote form and we can help you add one of these VS-2501 scales into your vet clinic. It’s one thing to be in the market for an industrial floor scale… It’s actually quite a bit different to be in the market for an industrial platform scale designed to weigh large coils of steel. Below we offer two different brands of scales to consider. 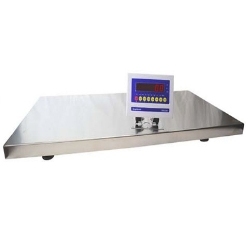 Both scales are manufactured by very good suppliers, Rice Lake and B-Tek. Let’s take a look at each below. The Rice Lake Weighing Systems RoughDeck CS coil floor scale is a reinforced version of the standard Roughdeck model which we have mentioned numerous times over the years. These scales are uniquely suited to meet the demanding process of weighing dense coils of steel. The world’s toughest weighing jobs demand a scale like no other. 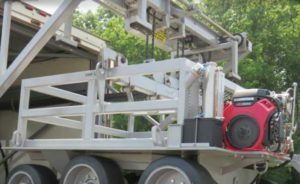 Rice Lake’s RoughDeck CS was born for the unique task of weighing dense industrial materials to Legal for Trade accuracy. For steel coils, castings, cable spools or more, see why RoughDeck CS is the first and only scale investment you’ll ever make. Steel handling is the ultimate test for industrial equipment. The RoughDeck CS’s tightly spaced steel I-beams, half-inch thick top plate, and the patented G-force™ self-checking mounting system make it the most solidly constructed scale on the market. And when it comes to extreme conditions, the RoughDeck CS takes a punch and comes back for more, delivering accurate results, day after day. Rice Lake’s RoughDeck CS is Legal for Trade in capacities up to 100,000 pounds. Choose a standard platform size or we can design a RoughDeck CS to your custom specifications. Another choice to consider when weighing steel coils is the B-Tek manufactured platform scale. 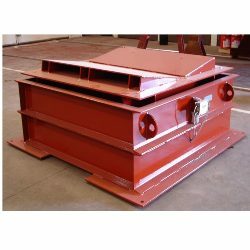 The High Impact Coil Scale offers a rugged structural steel weighbridge and the reliability of double-ended shear beam load cells to provide legal for trade accuracy in extreme industrial applications. Industrial weighing operations require heavy-duty, reliable scales that function 24 hours continuously. B-TEK offers a complete line of High Impact scales to satisfy these demanding applications. The High Impact series scales can be utilized in a number of applications, including: coil, pipe, and steel processing. Also, The High Impact scale can be used for coil transfer car weighing and coil processing lines. So as you can see, both the above choices would make an outstanding choice for your steel weighing needs. If you need additional information or a quote, please contact the Central Carolina Scale sales department by phone at (919) 776-7737 or you can complete the Request a Quote form on our website. Then, ask lots of questions, and listen carefully to the answers. Sometimes things are pretty straightforward and other times…. not so much. Listen to your experienced scale sales person in order to fully understand the unique application requirements that usually exist when you are looking to install a certain truck scale in a certain location. We touched on the subject of truck scale prices a few months back. The following list will help to ensure that you have a very good understanding of what is involved in choosing the right truck scale, along with all the site particulars. Some “Site and Installation” considerations to look at when it comes to choosing a truck scale. 1. What is the soil’s bearing capacity? 3. Are there any natural sub-surface obstructions to deal with such as bedrock, sink holes, boulders, high water tables? 4. Are there any man-made obstructions to consider such as gas lines, power lines, water lines, sewers and drains? 5. If applicable, what is the frost line? 6. Where will the scale house or unattended kiosk be located? 7. Have local authorities approved plans for the foundation and approaches (and ramps if above grade)? 8. How will vehicle speeds be controlled when entering and exiting the scale? 9. Are there any concerns with vehicles backing up onto public streets or highways during peak periods of scale usage? 10. Does there need to be a staging/parking area during peak scale usage periods? 11. Is there sufficient area for a bypass around the scale(s)? 12. What is the turning radius of the largest vehicles that will access the scale? 13. Are there any plans for overhead filling of vehicles while parked on the scale? 14. What if plant capacity increases and a single truck scale becomes an operational bottleneck? 15. Does the location offer enough room to expand with another scale? 16. How will you address the effects of heavy rainfalls or snowfalls? 17. Are there provisions to deal with downtime for scale maintenance or repair? Below are some “Truck Scale” Product impacting considerations to look at. 1. Steel deck or concrete deck? 3. How many vehicles will be weighed per day, per month, per year? 4. Will they be weighed both empty and loaded? 5. Anticipated dual tandem axle (DTA) weights? 6. List of all vehicle types that will use the scale? 7. Are all axle loads legal for highway travel or are there some heavier axle loads such as found on some yard-only vehicles? 8. Will tag/pusher axles be lowered or raised when vehicles are crossing the scale? 9. Will the scale be used in both directions or one direction only? 10. How much scale under-clearance is required by local weights and measures? 11. If the scale is going to be above ground, are there requirements for a guide rail system that is attached to the platform? 12. Do you have involvement with Mine Safety and Health Administration (MSHA)? 13. If the scale is going into a pit foundation, how will the pit be accessed? 14. If manholes are required in the scale platform, are there specific locations where they need to be to line up with drains or sump pits? 15. Are there any corrosive chemicals that the scale will be exposed to? 17. Will the scale surface typically have gravel/sand/debris sitting on it or will it be kept reasonably clean? 18. How long do you expect the scale to last? By answering these questions and listening carefully to your scale professional, you can gain a clear understanding as to what type of truck scale you need along with any features or upgrades that may be recommended. Our experienced staff can provide some examples of do’s and don’ts from other projects along with many success stories. With any large vehicle scale purchase, you will want to factor in the other costs as well when comparing products. Things to consider include; lead time, freight costs, installation and calibration costs. In addition to standard payment choices, we also have some lease programs available as well. Call (919) 776-7737 or fill out our Request a Quote form on our website. Let’s see how a truck scale weigh station generally operates. In many states all across the United States, Weigh Stations are an important part of truck size and weight enforcement efforts. They help protect DOT investments in road and bridge infrastructure by identifying overweight violators. State DOT’s typically own and maintain multiple weigh stations around your state and usually the State Patrol, or some other related state agency, is responsible for their operation. In addition to catching trucks that are overweight. Another purpose of weigh stations is to increase highway safety by identifying defective vehicles and unqualified drivers. Hundreds of thousands of vehicles are weighed at the various weigh stations each year. For many years, the standard weigh station consisted of a small structure on each side of the interstate. Beside each structure was usually a couple of large truck scales. Depending on the number of vehicles that travel that particular road, some weigh stations might have many more truck scales on each side of the road. In today’s modern world, some weigh stations even utilize weigh-in motion technology in addition to the stationary deck scale. As a truck goes by, usually there will be a lighting system and that will tell the truck which direction to go and if it gives them a green light to go to the by-pass lane. If it gives them a different signal, then they need to approach the actual truck scale. Then at that time, they will drive over the scales. Many weigh stations have locations on each side of the road, so they are able weigh trucks going in each direction. Law enforcement usually watches as the trucks come through and are usually looking to see if there’s any weigh violations. 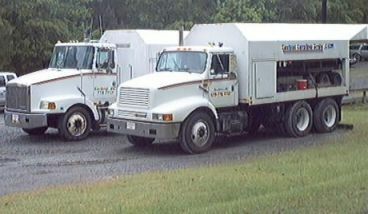 Then after that they are also looking at the equipment to make sure a truck is in compliance with proper names on the side of the doors, DOT numbers, annual inspections that have been done on the equipment as well and making sure that everything is working as it should, as they drive over the scale. If law enforcement find any violations, they will interact with the truck driver and collect some information. Then, sometimes the truck is pulled to the side and an inspection is conducted. DMV officers are not only looking for weight, but they are also looking for vehicle violations; such as headlights, flat tires and so on. Inspectors also look at permits, making sure that they’re in compliance within the State. Officers also monitor watching the traffic as it’s coming up to the scale. As it’s coming up to the scale, if it starts backing up where it’s backing up out onto the roadway, they can shut the scale down so they are not causing any issues on the road itself. When a truck actually drives on the scale it usually goes something like this. You enter the lane where the scale is located. Now you need to wait for the truck ahead of you to clear the scale. The truck ahead of you is okay to go as the sign indicates. Now the sign says, pull on to scale or perhaps you see a green light. Now you will slowly drive on to the scale and the system will automatically position the driver to stop at the correct location. The sign usually says, stop or displays a red dot. The truck stops and the weight of the truck is examined. If everything is good, the driver will be given the green light from the inspector and allowed to drive off. Weigh stations help to make the roads safe for all users. Weigh stations help accomplish this by creating a level playing field holding all trucking companies accountable for the same vehicle and driver regulations. And these inspection results, in turn, help trucking companies improve safety and performance. States must remain committed to providing facilities and equipment that easily and efficiently identify violators of size and weight requirements. Preserving and maintaining a states infrastructure as well as providing a safe roadway and bridge system is important for every state. And finally, it’s important that states commitment continues regarding data collection and technology as well as investment in important weigh scale system. As many state leaders have seen, weigh stations are an important part of the overall truck size and weight compliance program. State DOT programs need to remain committed to working with partner agencies and other stakeholders in developing effective truck size and weight compliance strategies. 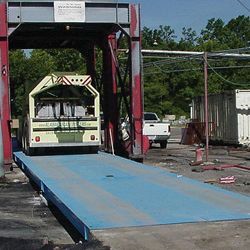 Central Carolina Scale, located in Sanford, North Carolina has provided truck scale sales and service for these types of scales for decades. The company understands that high quality weighing equipment is paramount when you are weighing the quantity of trucks often seen at a weigh station. For additional service or sales information, call (919) 776-7737 or visit the company website and complete the Request for Quote button. 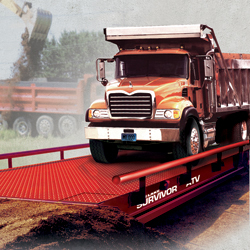 Rice Lake Weighing Systems, maker of the popular Survivor line of truck scales, has been manufacturing a portion of those scales in Alabama for many years. However, due to increased demand, an additional manufacturing facility in Jasper, Alabama has been acquired which will allow Rice Lake to expand manufacturing capabilities. In an effort to expand manufacturing capacity and provide additional support to their customers, Rice Lake is expanding their presence in Walker County with the purchase of an additional manufacturing building located in Bevill industrial park. This additional facility will increase manufacturing capacity for the company, where employees will produce Rice Lake SURVIVOR® truck scales among other product lines as production comes online. Rice Lake Weighing Systems is looking forward to the facility becoming operational as soon as possible by hiring skilled employees and procuring advanced manufacturing equipment. Rice Lake Weighing Systems and previously as Powell All Steel Scales has enjoyed more than 30 years of manufacturing in Jasper, Alabama and is grateful and proud of the Jasper community and those who have helped the company succeed. Rice Lake Weighing Systems is a family-owned, ISO 9001 certified corporation, and has been manufacturing and distributing weight-related products and supplies since 1946. Today, Rice Lake Weighing Systems is a global leader in measurement and automated process control with a dealer network covering over 85 countries. Headquartered in Rice Lake, Wisconsin, Rice Lake Weighing Systems has additional facilities in North and South America, Europe and Asia. Customers interested in purchasing Rice Lake scales and weighing equipment can contact authorized distributor, Central Carolina Scale located in Sanford, North Carolina. You can call the sales department at (919) 776-7737. Central Carolina Scale has sold and installed numerous Rice Lake scales and weighing systems. The company also provides calibration services for Rice Lake products as well. The majority of this article is provided by Rice Lake Weighing Systems. We have also added a few insights and thoughts of our own as well. A load cell, also commonly referred to as a transducer, converts a mechanical force into an electrical signal. Basically, the load cell bends slightly when weight is applied. In a compression mounted load cell where the load cell is beneath the weighing vessel, like a truck scale, the load cell compresses when a load is applied. This would apply to scales like the Cardinal PRC which has the SCA load cells. The load cell produces an analog output signal that is proportional to the applied weight or force. The load cell transmits this signal to a digital weight indicator that converts the signal into a digital weight measurement. When an application requires multiple load cells, each load cell should measure the same proportion of the total load. So in a four load cell system, each load cell should measure exactly one quarter of the load. Many load cells are proprietary to a specific manufacturer, and may require additional maintenance and costs of ownership. Carefully discuss with your scale supplier all options for load cell systems. The most common load cells on the market work on the strain gauge principle. All load cells need to convert their analog values to digital before the load’s weight reading can be displayed on an indicator. Some load cells are directly cabled to the digital weight indicator where the translation occurs. Other cells are connected to summing junction boxes on the scale where the box sums analog readings from multiple load cells, converts it to a digital signal and sends that signal to the digital weight indicator. Unlike most other load cells, hydraulic load cells do not use strain gauges or internal circuitry. Instead, hydraulic load cells contain hydraulic fluid, and during compression, a change in pressure is created and transmitted via tubing to a summing system where the pressure is applied to an analog load cell to determine weight. The advantages of the hydraulic load cell typically relate to being resistant to lightning damage. The disadvantage of this type of scale and replacement load cell is the cost. Some analog load cells perform the analog-to-digital signal conversion within the load cell housing. Although sometimes referred to as digital load cells, the cell still measures in analog. Making the conversion from an analog signal to a digital signal in the load cell allows the system to compare the output of individual load cells and perform a diagnostic analysis based on that information. Some would say that because the conversion happens in the load cell, sensitive electronic components are increased throughout the scale system, making them susceptible to damage from vibration, moisture and increased solder joints. 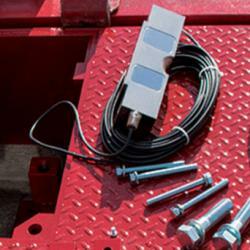 This is the most widely used vehicle scale load cell configuration in North America. A double-ended shear beam load cell is a compression load cell that offers a large capacity range from 1,000 to 200,000 pounds. The double-ended shear beam is secured at both ends with the load applied to the center of the load cell. As in all shear beam designs, the strain gauges are mounted on a thin web in the center of the cell’s machined cavity. The load cell also has the advantages of being less expensive in high capacity applications than the canister load cell because it does not require checking, making it virtually a maintenance free solution. A canister load cell is the oldest load cell type. Also a compression device, it is shaped like a vertical canister and can handle loads from 100 to 1,000,000 pounds. It is either hermetically sealed or welded to protect the gauges. This load cell’s drawbacks include the fact that it requires checking — installing check or stay rods to hold the weighing vessel in place on the load cell’s top plate during weighing. For these reasons, many canister load cells on the market today are used to replace older canister load cells on existing weighing systems. Some manufacturers prefer rocker column load cells because they are inexpensive. However, they require check rods and bumper bolts that require maintenance, increasing your cost of ownership. The cost saved by the manufacturer on the raw material is passed down the line to the end user in the form of additional maintenance. Truck scale load cells are generally made of stainless steel or alloy steel, but most manufacturers offer a variety of load cell solutions that best fit your application needs. Load cells manufactured from tool alloy steel elements are by far the most popular cells in use today. The cost to performance ratio is better compared to either aluminum or stainless steel designs. The most popular alloys are 4330 and 4340 because they have low creep (the change in load cell output over time while under load) and low hysteresis (the difference between load cell output readings for the same applied load). Stainless steel cells are more expensive than tool alloy steel load cells. They are sometimes fitted with hermetically sealed web cavities, which make them an ideal choice for corrosive, high-moisture applications. Stainless steel load cells that are not hermetically sealed have little advantage over comparable cells constructed of tool alloy steel, other than a higher resistance to corrosion. We hope you enjoyed learning more about the different load cells found in the average truck scale. Since 1980 we have been providing customers throughout the central part of North Carolina with truck scale inspections, scale repair and calibration services. Our test weights and weight cart are certified by the state of North Carolina for accuracy. Our scale technicians are highly trained and knowledgeable when it comes to checking and installing various brands of truck scales. If you need your existing scale checked or perhaps you’re in the market for a new truck scale, please give us a call today (919) 776-7737.